Live and kicked the bucket. Ginger Baker wasn’t the only one who was difficult to get along with, and after two albums and less than two years the WBL conglomerate crumbled. 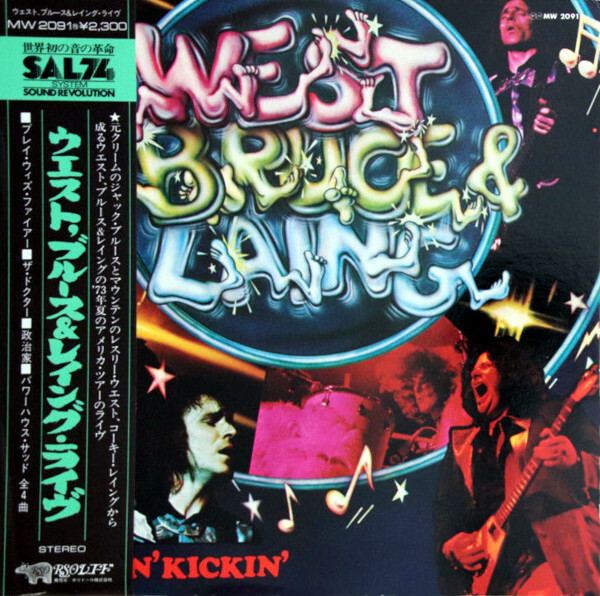 By the time Live ‘N’ Kickin’ was released, the trades were already looking forward to Jack Bruce’s next solo album, not looking back at the strange crew of West, Bruce & Laing. The album shakes out similar to the posthumous Live Cream releases: a handful of songs now stretched into epic adventures. The song selection is interesting in that only one WBL song is featured, “The Doctor.” (As others have pointed out, “Play With Fire” is actually “Love Is Worth The Blues” adapted to Jagger’s lyrics.) The second side showcases a pair of Jack’s songs: “Politician” and “Powerhouse Sod.” Apparently, even the band seemed bored with the prospect of playing their own music. Live ‘N’ Kickin’ has the soloing of Leslie West to recommend it, no small matter, and Corky Laing (finally) does exactly what you’d expect the drummer in a power to do by overplaying to fill the gaps. As for Jack Bruce, his live performances were always erratic, and I don’t think the drugs helped this time around. The live version of “Politician” that appeared on Live Cream II, for example, was insanely loud, but that insanity was half the fun (or three-fifths the fun, since insanity is hard to measure). I don’t believe the first two WBL studio albums are essential purchases, and this posthumous live album is less essential still. If you’re inclined to follow Leslie West and/or Jack Bruce, you’ll enjoy West’s solos and maybe even light a candle for Bruce during his otherwordly performance on “Powerhouse Sod.” But carry a torch for WBL? No. It was a marriage of convenience, the honeymoon was over, and Live ‘N’ Kickin’ is a bit like mailing honeymoon postcards after you’re already back from the trip and bickering. Jack Bruce (bass guitar, vocals), Leslie West (guitar, vocals), Corky Laing (drums). Produced by Bob D’Orleans with West, Bruce & Laing; engineered by Danny Turbeville; re-mix engineered by Tom Hummer. Album design by Pacific Eye & Ear. Illustrations by Carl Ramsey. Photography by Carl Pulin. Released on elpee, cassette and 8-track in April 1974 in the US (Columbia/Windfall, KC/CA 32899), the UK (RSO, 2394 128/3216 028) and Japan (RSO, MW 2091); reached #165 on the US charts. Re-issued on compact disc in West Germany (Polydor, 841 038-2). Re-issued on compact disc in 1992 in Japan (Polydor, POCP-2171). Re-issued on compact disc on August 25, 2008 in the UK (Esoteric, ECLEC 2072). Re-released on remastered compact disc in 2013 in the US (Culture Factory).